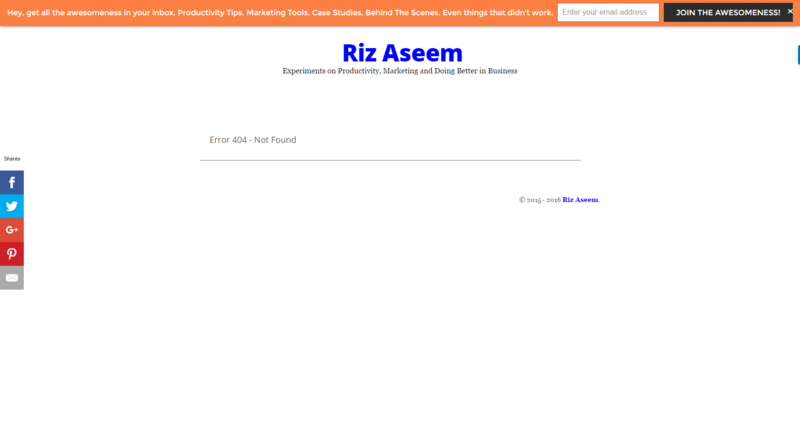 My name is Riz Aseem. I'm from Vancouver Canada. You know how some business owners have a busy season -- where they have too much work. And then they have a non-busy season, where they are struggling to make ends meet. Well, this is something that happened to me. As a Chartered Accountant, I went through this in my life. Where some months I was working 60+ hours a week and making $100,000 and then there were months where I hardly had a client walk into the office. This up and down cycle of the business really got me down. So I started to focus on a way to bring in regular clients all year. I'm here in this forum to share my journey -- and learn along the way how others have done this before me. I hope to help some of the members here -- and hope that some members here will be able to help me grow my business further. P.S. Want to be more productive in your business? Click here to get my the guide “7 productivity tools every business owner must have”. Welcome to the community, Riz! It seems as if you have plenty of experiences and insights to share with the community, and I am sure there is a lot you can learn from your fellow community members as well. Just abide by the Community Guidelines, and engage in conversation, and you'll absolutely get the most out of our forum. Thanks for joining! Thanks Ryan. I appreciate the warm welcome. It looks like a great community -- and I'm looking forward to being a contributor here. Welcome here. Looking forward to learn from you as well. hello.. i am new here in the community.. I think you will find our community to be quite insightful. Don't hesitate to provide your ideas, opinions, experiences, questions, etc. Phenomenal storytelling in your first comment! I'm interested in hearing more.